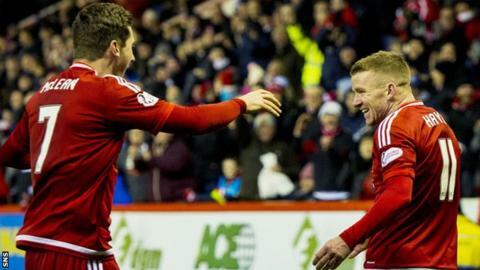 Aberdeen recovered from a poor first half to beat Ross County and move to second in the Scottish Premiership. Craig Curran gave the visitors a deserved lead after latching onto Liam Boyce's through ball. Two quick fire second half goals turned the game around; Adam Rooney finishing Niall McGinn's cutback before Jonny Hayes found the top corner. Kenny McLean provided the third; playing in McGinn who outpaced the County defence and poked in a third. Ross County were in control of the game during an opening period where the Dons looked to be suffering from the sort of dip in form that has seen them slip from comfortable leaders in the title race to seven points adrift prior to this clash. The transformation after the break was amazing and certainly a major surprise for the Staggies players as they were picked apart down their right flank where all three Aberdeen goals originated. A Dons team that lost just three goals in their first eight games conceded 16 in their second eight so it was no surprise that manager Derek McInnes altered his side. Not that they had much time to settle into that new set-up before the Staggies hit the front after an industrious and determined start from the visitors. Boyce dispossessed Mark Reynolds on the half way line and while the defender claimed in vain for handball the Northern Ireland international burst forward at speed. He then played in Curran on the right side of the penalty area and from an acute angle he drilled in a fifth goal of the season despite Shay Logan's attempts to rescue things. By then Rooney had passed up a half chance created by McGinn's wickedly flighted free kick, but the Irishman hooked the loose ball high over the crossbar. The same combination once again left the County defenders spectators, but on that occasion Rooney could only steer a diving header wide of the far post. The Dons still looked nervy whenever County pushed forward, but the closest they came to a second goal was a long range free kick from Jackson Irvine that flashed well wide of the post. Whatever McInnes said to his players at the interval certainly worked as the Aberdeen players who left the field to a chorus of boos at half time were being cheered to the rafters within minutes of the restart. They played with more pace and aggression while McGinn produced a moment of magic to set up the leveller for Rooney with a dummy that left poor Marcus Fraser spinning. He then set up the Dons top scorer with the sort of perfect cross that invited the shot into the roof of the net that it received from eight yards. Two minutes later Hayes tormented County on the left side of the box and his shot come cross dipped under the bar and into the net for his fifth goal of the season. It was a stunning setback for the visitors given how well they played in the first half and try as they might to recover they only rarely threatened an Aberdeen side playing with more confidence. When they did Boyce sent a diving header from substitute Jonathan Franks too close to goalkeeper Danny Ward who managed to claw the ball away. Then just to rub it in McGinn got the reward for a fine performance by drilling in the third goal when stabbing in McLean's cross. Match ends, Aberdeen 3, Ross County 1. Second Half ends, Aberdeen 3, Ross County 1. Corner, Ross County. Conceded by Craig Storie. Attempt saved. Jackson Irvine (Ross County) header from the centre of the box is saved in the centre of the goal. Corner, Ross County. Conceded by Mark Reynolds. Substitution, Aberdeen. Ash Taylor replaces Paul Quinn because of an injury. Paul Quinn (Aberdeen) wins a free kick in the attacking half. Substitution, Aberdeen. Craig Storie replaces Willo Flood. Attempt missed. Alex Schalk (Ross County) left footed shot from outside the box is close, but misses to the left from a direct free kick. Hand ball by Willo Flood (Aberdeen). Attempt saved. Adam Rooney (Aberdeen) right footed shot from the centre of the box is saved in the bottom right corner. Goal! Aberdeen 3, Ross County 1. Niall McGinn (Aberdeen) from a free kick with a right footed shot to the bottom right corner. Substitution, Ross County. Raffaele De Vita replaces Tony Dingwall. Corner, Aberdeen. Conceded by Scott Boyd. Attempt saved. Liam Boyce (Ross County) header from the centre of the box is saved in the top right corner. Substitution, Ross County. Jonathan Franks replaces Stewart Murdoch. Attempt missed. Martin Woods (Ross County) right footed shot from outside the box is high and wide to the right from a direct free kick. Corner, Ross County. Conceded by Graeme Shinnie. Richard Foster (Ross County) wins a free kick on the right wing. Hand ball by Graeme Shinnie (Aberdeen).